The Peter Lynn Fury is the high-end freeride kite with massive potential. The high Aspect Ratio and 5 strut setup will deliver great performance in all areas of use. The Peter Lynn Fury is a kite that will be most valued by demanding riders that will use its performance and potential to progress to the next level. Every size has been designed specifically with a particular use in mind. The smaller sized Fury (7-13m2) excels in freeride, wave and allround performance. Every size has been designed specifically with a particular use in mind. The smaller sized Fury (7-13m) excels in freeride, wave and allround performance. The Peter Lynn Fury Lite has been derived from the Fury and graphically they are the same, but that is as far as the comparison goes. The Fury Lite (15m and up) has been optimized for light wind conditions and its construction has been tuned to suit the particular requirements of the racing scene. The Fury Lite performs extremely well in races, without compromising too much of its freeride character. 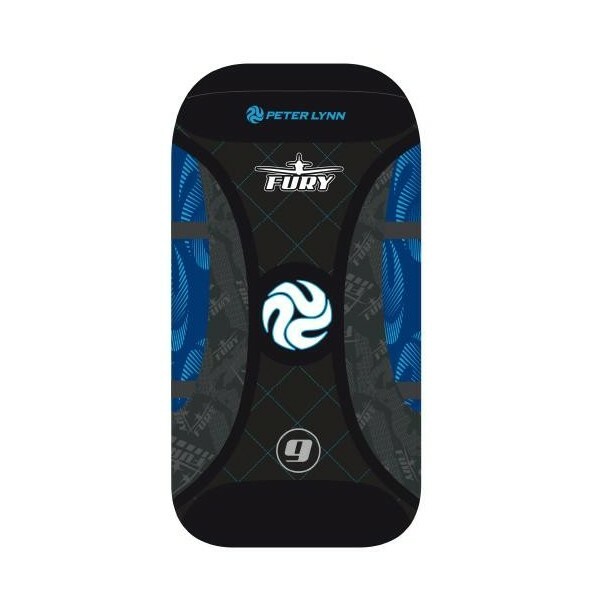 The biggest size in the Fury Lite range, called the Fury Ultra Lite, is 19m. 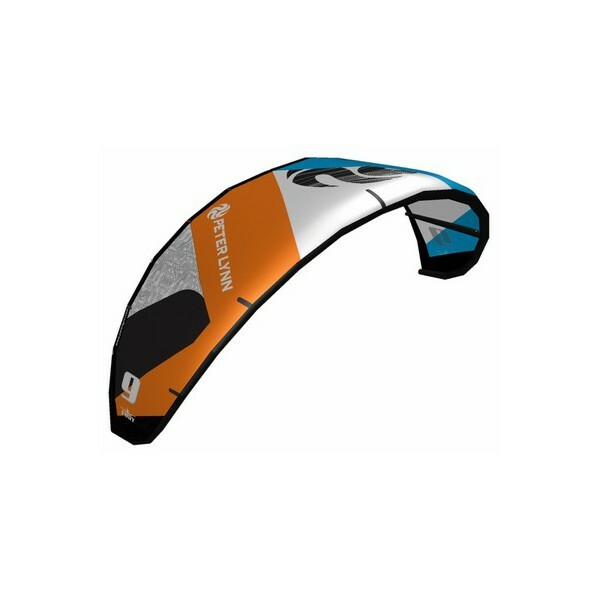 The Fury Ultra Lite is the superlative of light wind kiting. It is specifically designed for low wind conditions. With the single goal in mind to give good performance even in the lightest breeze, this kite will keep you going and grinning while others are off the water. 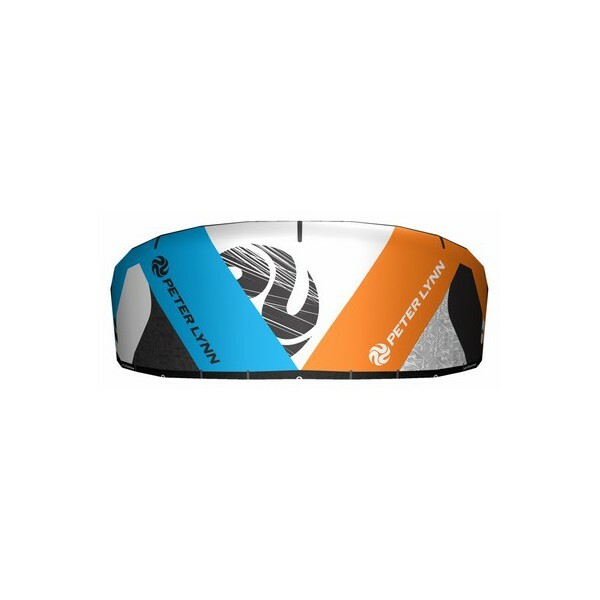 The Fury Ultra Lite is available on special order only. The Peter Lynn Fury is the high-end freeride kite with massive potential. 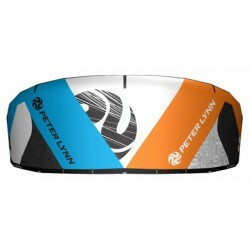 The Peter Lynn Fury brings unprecedented performance and potential to progress to the next level. Its flying speed is almost unlimited, this kite makes you go faster than ever before. And with that speed comes your potential to go bigger in freeride and beat any competition in a race, whatever their level! Potential can only be used when you are in control! As with the Peter Lynn Escape, the Fury brings you supreme handling and rider feedback. Take it to the edge, build up that power and unleash it, race it at topspeeds, you will feel assured you can handle it due to the superb handling that the Fury kites have to offer. The Fury flies far at the end of the wind window, the upwind performance is phenomenal. Great for getting back to where you started after riding some waves or having done some lofty jumps. In racing this characteristic will take you to the upwind buoy with ease. Do you like those big jumps? The Peter Lynn Fury is your choice. The Fury likes to be flown at high speeds, send it with speed and look down upon the water vanishing below you, while you fly higher and higher. 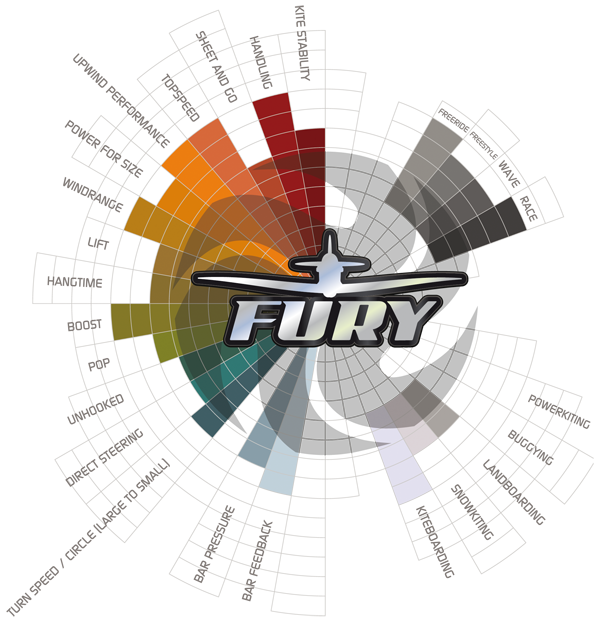 You will not only go high, you will stay there for a floaty, lofty flight… the Fury logo is a plane for a good reason! If you like full power kiteloops, then this kite is your choice too. Experienced riders will love the boost this kite brings. Adrenaline junkies rejoice! the edge of the window when riding waves, the smaller sized Fury will deliver! The bigger sized Fury Lite is tending more to racing and light wind kiting. 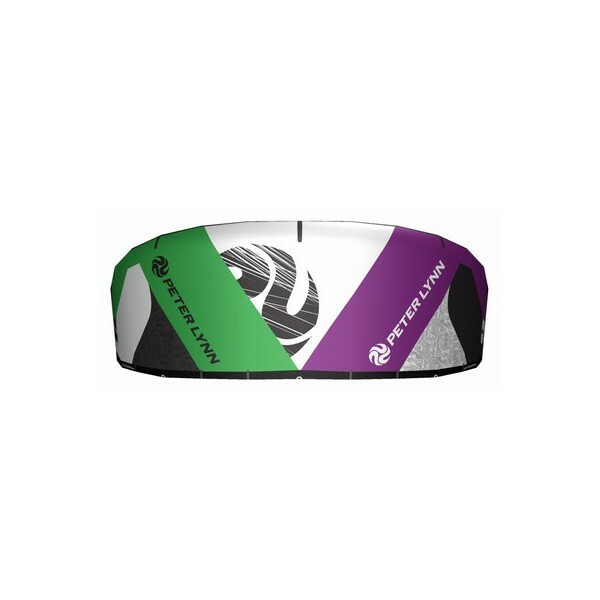 Combine it with a raceboard and you’ll have an extreme performing racewinning combination. The 15, 17 and 19 metre Fury Lite will excel in any race, while their characteristics will still shine in freeriding too. Big lofty jumps, riding upwind, racing it fullspeed, the Fury and Fury Lite deliver on, and on, and on. Although the Fury is designed as a high aspect ratio kite, restarting is still best in class. The full depower and Navigator SL safety system make the kite as safe as you may expect from modern kite design. Overall, the Fury has a relatively high aspect ratio, for optimum performance. The smaller sized Fury has a lower AR to improve stability in strong winds, the bigger sized Fury Lite has a higher AR to optimise the kite’s performance in racing and light winds. The Fury has been developed from a ‘green field’ situation, as a completely new design. Incorporating the expertise of decades of kite development at Peter Lynn, this profile is tested, developed and proven sublime for its use. The Fury was designed around a 5 strut rigid frame for the best stability and control. The Fury has a Supported Leading Edge (SLE) format, for its depower characteristics and huge windrange benefits. The Fury was built with the highest quality materials. Tejin Technoforce T9600 polyester is used for the canopy, combined with Dimension Polyant Dacron reinforcements and wingtips. The frame is very rigid due to the direct connection struts. For durability the struts are reinforced with seam protection to prevent tear. For fast inflation, the Peter Lynn has a proven single point inflation system. Just pump the kite through the center inflation point and it will be ready for use in no time. 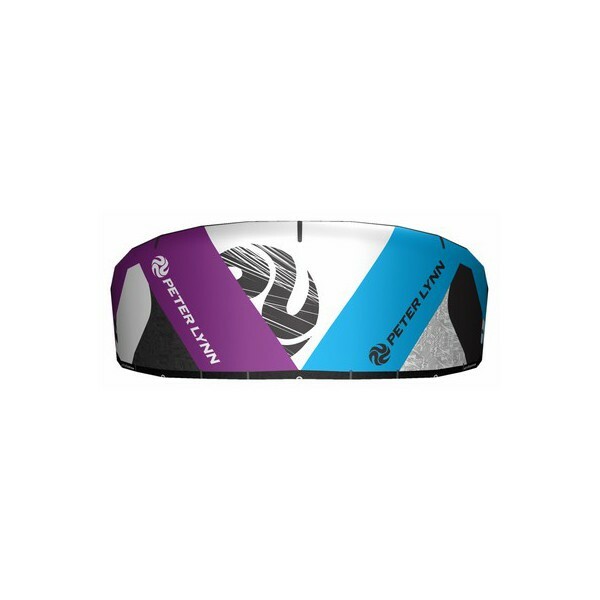 For durability and wear protection the tubing and valves are protected with a Neoprene cover. Dacron use has been optimized for the best match between weight and longevity. Due to ‘tailor-made’ placement and panelshaping, the Dacron ensures a long lifetime. Tailoring the amount and placing of relatively heavy Dacron material to the size and target use of the kite ensures low overall weight of the kite, adding to responsiveness and overall control. The frame, struts and leading edge are built with the most durable Dacron. The Leading edge has been reinforced along the complete stitch seam and the leading edge has Peter Lynn EVA bumpers to protect it from damage whenever the kite crashes. Making it one of the toughest frames on the market. For optimised durability and low weight, the trailing edge has a double layer Technoforce construction with Bisonyl reinforcements for maximal durability. To prevent wrong attachment of the front and rear lines to the kite. Backline connection points offer adjustments to change the bar pressure to personal preference. To further define the kite’s characteristics to suit your personal preference, the Fury (i.e. only complete kites, including bar) is supplied with 3 m extension lines. The longer lines will give the kite a better low end, the shorter lines make it a bit more snappy and aggressive. With the extension lines you can set it up to your personal preference. 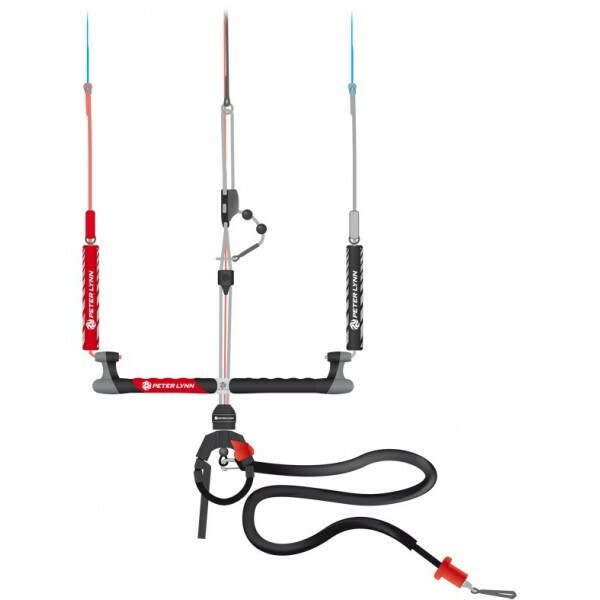 The Naviator SL 45-55cm Control bar will fit all size kites and comes complete with 21m lines + 3m line extensions. Variable High Aspect Ratio - Smaller sizes have a lower AR to improve stability in strong winds, bigger sizes have a higher AR to optimise the kite’s performance. 5 Strut high performance frame with reinforced Dacron Leading Edge. 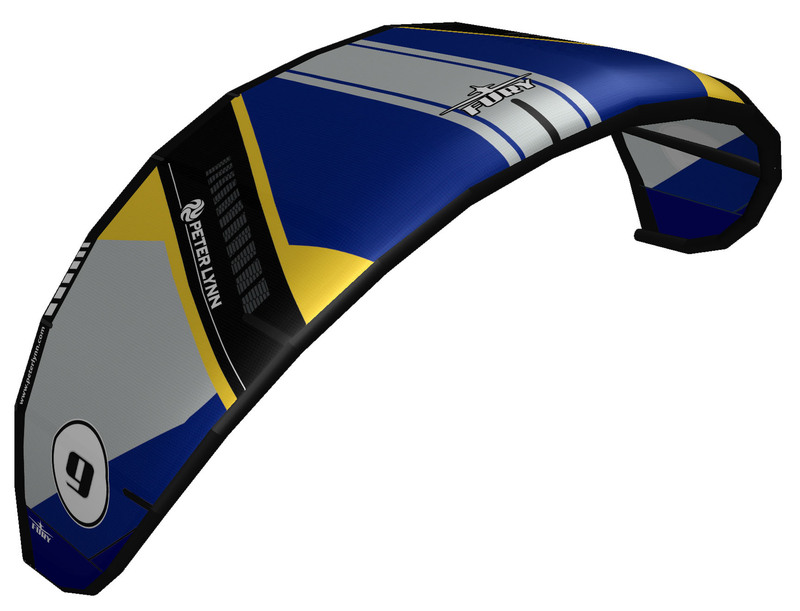 Tejin Technoforce T9600 polyester canopy with Dimension Polyant Dacron reinforcements and wingtips.